«Ideospheres of Pain» is a thought-provoking short novel that illustrates the passions, pitfalls, pains and problems that can occur when ideas are made into static ideals and ideologies, often masking both humaneness and the individual's experience of Life itself. The author gives the first clue to the contents and perspectives of her book in the rather unusual title. According to Wikipedia, the concept of an «ideosphere» was first promoted by Aaron Lynch and Douglas Hofstadter in the 1980s. An ideosphere exists in the minds of people, and is the place where thoughts and ideas are created and nurtured. Nandy approaches this interesting subject matter with both a seasoned philosopher's aplomb and a novelist's attention to «storytelling as a medium», weaving in and out of the traffic queue of events and voices with precision and speed and then with looseness. 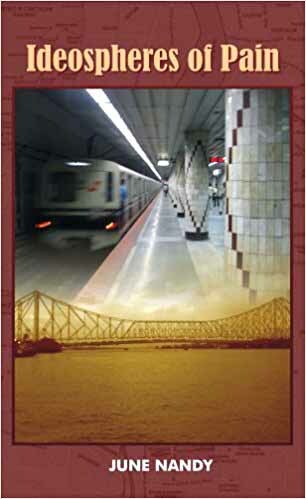 This is a mostly-English language bilingual work, that endeavors to juxtapose the high-level English of educated Indians against the more common local English, revealing much about the role of language in various social settings. After all, it is language/speech and thereafter actions/behavior that set our thoughts/ideas into a communicative and «predatory» mode. There is so much of want; so much of need; so much to give; so much to take; so much to love and be loved. Moments, to end the despair; moments, to eternal hope ...away ... away ... agony ... let me live to the point of pain ... away ... my inability ... look ... I ... live. Here the resultant pain of giving life to ideologies is perhaps also the key to finding oneself again in self-realization, thus completing a circle of confluence, identity and struggle – catapulting itself back to the only real affirmation of existence: individual pain and emotion. Perhaps, I am in the wrong place, looking for a right answer. Here, nobody speaks the truth ... here, no body hears the truth. It is always the pleonasm that defeats the humanism. Nandy has a good visual sense and her style is to the point, again showing the essence of a poet in its economy and striving to get the reader to co-create the literary experience without being spoon-fed all the details. It is perhaps here that the author also at times risks losing the less-creative reader in the rather abrupt transitions from one story sequence to the next. In this way and others, this book is truly a book for fellow authors and the choir (i.e. those that do not need to be told all the details of the story all the time because they have lived it in their own ways and know ...). On another level, this style of writing also underscores the non-reality of «reality», the jaggedness of human perception and experience, and the innate confluence of thought/ideas/perceptions and ideologies. The level of comprehension within the individual reader itself determines the perceived success and effectiveness of the style of writing. And finally, this book gives a good depiction not only of the confusion that religion, social mores, legal and political institutions wreak upon inhabitants of India, but moreover of the controlling aspects of such ideospheres of pain in world society at large. Although here interpreted in an Indian cultural, social and political context, this book could have been (and perhaps should be) written in regards to every society on the planet Earth. -- Adam Donaldson Powell, 2010, Norway. Adam Donaldson Powell is a literary book reviewer, a published author and a visual artist.